Green: Due to the use of sunlight as energy source, no waste, no pollution of the environment, energy-saving. Easy to use: With ON/OFF switch to control, soft light effect, anti-dazzle, relieve visual fatigue. Metal flexible gooseneck: The neck can be adjusted any way you feel comfy without uttering a sound. 2 Ways of charging: Solar / USB powered, about 12 hours fully charged by solar; about 3-4 hours charging by USB. No need to replace batteries. 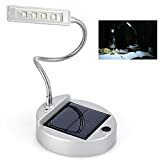 Innovative design, flexible and lightweight, easy to use and carry, mini size, makes it a wonderful table lamp for both indoor and outdoor use. * Flexible gooseneck can be adjustable to any angle, meeting your different visual needs. * Suitable for home, office and outdoor use like camping. * Energy-saving and super brightness design, easy to use and convenient to carry. 1 Usage: When solar panel under the sunlight for charging,the indicator light will light up. 2 Do not put this lamp in the area with high-temperature and high humidity. 3 Absorbing solar energy to solar panel, turns into electronic power,witch will be stored in battery-inside,then supply power for lighting. 4 With ON/OFF switch to control LED lighting.